Wash the shellfish under cold running water and discard any that are damaged or refuse to close when lightly tapped. Wash the coriander and finely chop, stems and all. Heat the oil in a wide saucepan over a moderate heat. Add the coriander, chilli, garlic and lemon grass and fry for a couple of minutes until softened and aromatic. Add the shellfish, mix thoroughly then stir in the sake and soy sauce. Increase the heat and cover. 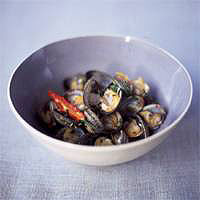 Cook for 3 minutes - or until the shellfish have opened - then serve immediately in large individual bowls.